Writer-director Scott Cooper (CRAZY HEART, BLACK MASS) returns to our screens with a deeply affecting, beautifully shot and acted western, penned by Donald Stewart, who scripted the The Hunt For Red October. The story is set in 1892. 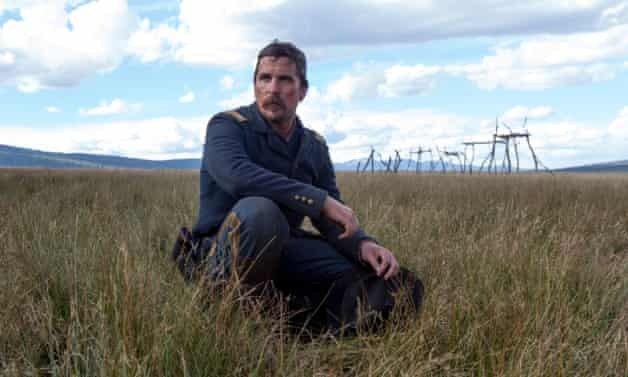 A tortured civil war hero called Blocker (Christian Bale - superb) has spent the intervening period slaughtering Native Americans. And then, he's given a galling order, to accompany a dying Cheyenne chief (Wes Studi) across the country to Montana so that he can die in his native land in Montana. And so what we get is road trip of sorts, south to north through the most magisterial but hostile landscape. This hostility is displayed in a prologue that sees a settler called Rosalie (Rosamund Pike) lose her entire family in a vicious Comanche raid. When Blocker rescues her, they and the Cheyenne come together in mutual defense against the Comanche who are tracking them. So who is truly hostile to whom? As the movie opens it's clearly the white people who are hostile to the Cheyenne. But Rosalie's desperate grief (Pike really goes for it in a career best performance) prompts an act of kindness from the Cheyenne and after that a kind of uneasy truce emerges that builds towards genuine respect and a willingness to die to defend the Other. Of course this comes at the expense of making villains out of the Comanche. There's no real attempt to understand why they have turned to such violence, except that we know what Blocker and his ilk have done in the past. And so we end up getting evil "red indians". Despite this mis-step I really loved this film. Christian Bale's portrays a really complex tortured man mostly through his physical presence and facial expressions. Pike's transformation from bordering-mentally ill grieving woman to fierce warrior is stunning. Masanobu Takayanagi's cinematography is breath-taking and I loved seeing the American landscape change as we move from south to north. And last but not least, Max Richter's score is heart-breakingly beautiful. I felt that I had come to love these characters and care deeply about their future. And was held on the edge of my seat to the end of the very final scene - one that affected me profoundly. HOSTILES is rated R and has a running time of 134 minutes. It was released at the end of 2017 and is now available to rent and own.